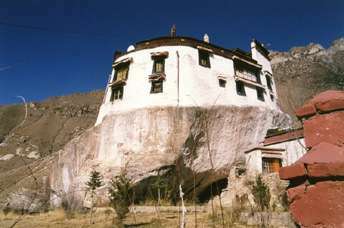 Pabonka Monastery is located about 8 km northeast of Lhasa City. It is perched on the lower slope of Mount Dukri. Your guide will lead you from the hotel to the north side of the city, where you will see a view of the monastery on the hillside. 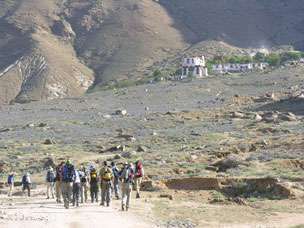 From there, you will follow the rugged foot trail up to the monastery. Phapong Gang monastery is built on a flat-topped granite boulder. The original structure at the site may even predate the Jokhang Temple. It is the well known as the place where Thonmi Sambhota invented the Tibetan alphabet. The self-raised, six-word mantra can be seen in the assembly hall. Walk around the the monastery and you may even get a chance to talk and have butter tea with the friendly monks who live there. In the afternoon, we will make our way back down the trail to the hotel and relax.